This is a solid debut album by the Brighton five-piece, and has been a long time in the making, with the oldest song on the record (Swim) being first released four years ago! This album is more than just a showcase of the band’s best songs though, with eight of the fourteen tracks being new for the album. 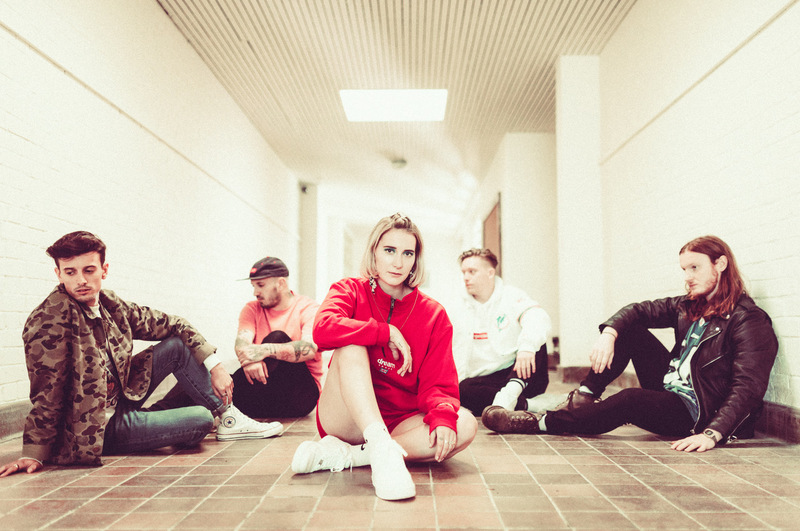 My pick of these is Bite, it’s an example of all the best things that Fickle Friends do: the nonchalance of lead vocalist Natti’s voice brilliantly juxtaposes the complex melody created by the fast-paced synth-pop beat. ‘You Are Someone Else’ follows the story of a fledgling relationship that isn’t quite working out. It tracks the realisation that the relationship is going nowhere – ‘we’re absolutely failing’ [Wake Me Up] – before it ends and the protagonist is left questioning their relationship with themselves and those around them. Some of this is explicit, for instance Hard to Be Myself, other tracks however show this theme more subtly, for example Heartbroken, which deals with the feeling that people aren’t being straight with you, instead hedging around the point and being afraid to offend in the form of people’s opinions on their songs. The album ends with the protagonist alone, but coming to terms with the break-up and the effect that it has had in a much better way than at first: Useless starts to rebuild self-confidence through the punchy swagger of the bass and lyrical recognition that it was never their fault. The innocent tone of Natti’s vocals and the almost naïve positivity of the track behind her provides a strange platform for such, often, heavy themes and emotional lyrics. Band favourite, Brooklyn, is one of the most upbeat songs on the album yet it combats the delicate topic of anxiety and how it can change your personality beyond recognition. I think this style works very well as a platform for these feelings, however, as it reflects how a lot of people actually experience them: no-one likes dwelling upon negative ideas and it personifies the day-to-day struggle for constant positivity that many of us experience. The album isn’t all at 100 mph though, there are more retrospective, slow numbers than I first expected, with In My Head providing the clearest example of the emotional maturity of the songwriting, and is placed perfectly to fit the narrative of the album. All of that may sound like the album is a bit of a dredge to listen to if you want to relax, but that couldn’t be further from the truth. Fickle Friends are notorious for the accessibility of their music, proven by their prevalence on radio and TV. This means that even if you haven’t heard of the band you’re likely to have heard and enjoyed some of their biggest tracks: both Glue and Swim have both been used by BBC and ITV, and most of the songs previously released by the band have made it to the Radio 1 playlist. This is because their sound is so easy to listen to! Beyond this, their sound inspires fun: straight from the outset you know how the album will affect you, Wake Me Up is an upbeat track that makes you want to dance, and that is what this band is all about. You can imagine Fickle Friends playing whilst at pre-drinks with your mates, dancing around while doing housework or whilst sitting in the garden with your mum – its vast applicability means it is more than likely going to be the soundtrack to many a summer this year! ‘You Are Someone Else‘ is out now, via Polydor Records. Next articleMØ - UK tour next week!